It feels a little odd to review this as my first real review since my hiatus, because I'm not sure how much I have to say. 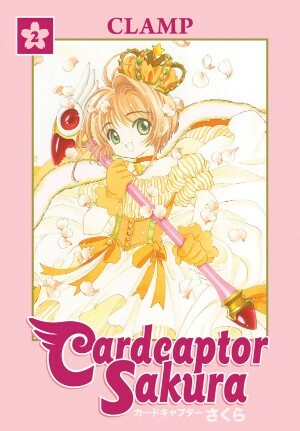 Most of what I wanted to say about Cardcaptor Sakura I said in my review of the first book in this omnibus release. That all still stands, and if you haven't read it, probably best to go there first if you're interested in this series. This volume wraps up the first main storyline, though there are plenty of loose ends, particularly in the relationships, to tie up at some point down the road. And the relationships do get more tangled, with misunderstandings, breakups, secrets, and surprises. There is the typical silliness, but also some poignant moments, too. There are also a few storylines that barely make sense. There is one story in particular that just seems crazy to me, involving Sakura's great-grandfather... who never tells her he's her great-grandfather... why would you do that? Why would he deny himself the pleasure of knowing his great-grandkids better? It can't be her father's doing, since he's not insane. Also that story was way rushed, and one gets the feeling we never, ever come back to it, either. Very odd in a manga series that generally deals with relationships and complexity fairly well. Highly unsatisfying, and a low point in a volume that is mostly quite good. It's an interesting experience reading the books, too, when I'm so familiar with the anime. There was another storyline that again seemed fairly rushed, this one involving a play Sakura's class is putting on for the school talent show, that was drawn out into a full episode in the anime series. It was a really well-done episode, and I'm afraid the manga counterpart rather suffers by comparison. Not as nuanced. This is actually true of the ending of this particular main storyline arc, too. While the ending of the manga made more sense to me, was definitely more clear, it was also WAY faster. Things happen without any pause for reflection, and then it's done. I wonder whether it would feel so anticlimactic if I had never seen the anime, where the events are drawn out over several episodes. Sure, I'm sure the producers were milking the manga to draw out what had clearly become a very successful series, but it actually worked; things felt more tense, like there was more at stake. But perhaps I wouldn't have noticed that if I hadn't seen the anime at all. Hard to know. I continue to recommend this series, but definitely read them in order. I'm looking forward to seeing the next volume, as I'm sure there are several things that confused the hell out of me in the anime that will make quite a bit more sense in the manga. Or here's hoping, anyway. I do what I can. :) It really is a wonderful series. I am so glad they're re-releasing them.